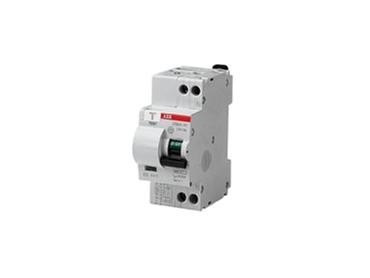 The DS9 RCBO range from ABB offers a protection solution for single phase circuits in modern power distribution applications. The DS9 range offers breaking capacities of 6kA and 10kA, overload protection ratings from 6A to 40A and models with sensitivities of 30mA, 100mA, 300mA, 500mA and 1A. The DS9 incorporates a reliable break of both active and neutral conductors in a compact 2 pole device. A two colour operating lever enables an easily visible red/green indication of the status of the device. In addition, a separate residual current trip indicator is available on the front of the device as standard. This enables a convenient indication of a trip operation due to the presence of an earth leakage fault. The DS9 also includes the trip mechanism from ABB where the closing of the contacts is independent of the rotation speed of the toggle during the final closing phase. This ensures superior reliability and safety for the most arduous situations. Through the simple but innovative design, the DS9 offers a range of accessories for the complex control circuits including auxiliary contacts, signalling contacts, shunt trips, under voltage releases and busbar combs.